In 1893 the Waldensians, or Waldenses, a Protestant sect that had emerged before the Reformation, settled a colony, named Valdese, in Burke County, eight miles east of Morganton. (The word "Valdese" is Italian for Waldensian.) The Waldensians had lived in the Cottian Alps in northwestern Italy on the French border. Their written history dates to the twelfth century; the leader for whom they are named, Peter Waldo, was a wealthy merchant from Lyons, France, who sold his worldly goods after a friend's death and became a preacher. The Waldensians were persecuted for more than 400 years before being granted full legal and political rights in 1848 by King Charles Albert of Piedmont and Sardinia. Waldensian groups migrated to other parts of the world, but the largest number came to Burke County in North Carolina. The American who promoted the emigration was Marvin F. Scaife, a capitalist from Pittsburgh who also owned land in the Morganton area. Scaife went to Rome and talked with Matteo Prochet, chairman of the Committee of Evangelization of the Waldensian Church. Colonization plans took shape, and the Waldenses sent two delegates, Jean Bounous and Louis Richard, to inspect land in Burke County. In late May 1893, 29 colonists under the leadership of Charles Albert Tron reached Burke County. Tron could speak English, but the others spoke only Italian and French. The settlement was named Valdese. In June 1893, the Valdese Corporation, which included Waldenses and American capitalists including Scaife, was established and purchased about 10,000 acres of land for $25,000 on credit from the Morganton Land Company. Tron, who negotiated the contract for the settlers, returned to Italy in July. Enrico Vinay, a Waldensian pastor, succeeded him and directed the affairs of the colony. During the week of 20 Aug. 1893, 25 more emigrants arrived, and another 178 were added to the community in November. The Waldensian settlers encountered many hardships. The infertility of the soil made farming difficult, and the layout of the land forced people to live at some distance from their nearest neighbors. The language barrier posed problems in communicating with Burke County residents who offered assistance. Fortunately, the Reverend Barthelemy Soulier arrived with his bride in June 1894, and his wise and strong leadership brought stability to the colony. The Valdese Corporation was dissolved, and families purchased individual farms. Soulier remained in the colony for seven years. Religion was the controlling influence in the lives of the early Waldensian settlers. The church in Valdese, which was part of the Waldensian Church of Italy, united in 1895 with the Presbyterian Church, similar in government and theology, and was admitted to the Concord Presbytery on 9 July 1895. A church building was completed in 1899. Baptists, Methodists, and other denominations established churches in the area as early as 1914. Education was also given much emphasis in Waldensian culture. 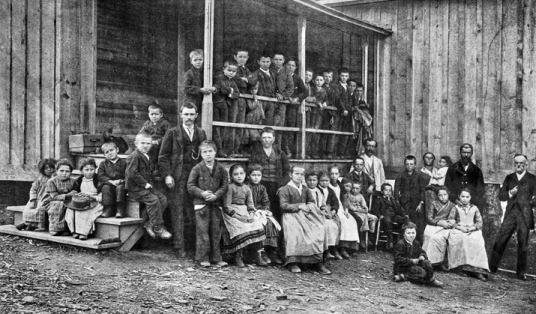 The first children to arrive attended a local school, but since they spoke no English, the Waldenses established a separate facility in January 1894 and succeeded in employing a series of competent, missionary-minded teachers. In 1905 the Waldensian school came under the auspices of the Burke County school system. While some progress was made in the area of farming, the success and prosperity of the Waldensian settlement was assured by industrial achievement. The Waldensian Hosiery Mill, established in 1901, paved the way for the growth of industry, and Valdese became one of the nation's leading hosiery manufacturing centers. The Valdese Manufacturing Company was created in 1913 to make cotton yarns. The Waldensian Bakery, built in 1915, at first delivered bread by horse and buggy. The establishment of other factories, banks, general stores, and restaurants promoted growth of the community and its prosperity. On 17 Feb. 1920, the town of Valdese was incorporated. The Waldenses continued to occupy outlying areas around Valdese such as Reynaud and Gardiole, and in time the population became more cosmopolitan. In 1938 the Morganton News Herald began to print "News of the Week in Valdese," and in 1943 a newspaper, the Valdese News, appeared. The Old Colony Players of Valdese has presented From This Day Forward, an outdoor drama in two acts, each summer since 1968. The play, which features authentic costumes and folk dances, portrays the Waldensian heritage. Tron Hall was established as a museum of artifacts and literature of early Valdese in 1958; the rapid growth of depositories led to the opening of a new facility, the Waldensian Museum, in 1975. The Valdese Chamber of Commerce was founded in 1930 and has cooperated with many civic, fraternal, patriotic, and service organizations in promoting town improvements. Maxine McCall and Kays Gary, What Mean These Stones? : A Centennial Celebration of Valdese, North Carolina (1993). George B. Watts, The Waldenses of Valdese (1965).